I've been doing this one pretty fast. I have 3 flakes done and am working on the base. This is for our United Way silent auction at work. this photo is of one of the flakes but it is not stiffened so it will be bigger when done. and this is a photo from the pattern of what it should look like when done. What do you use to stiffen them, just starch? I love the delicate look - is it your own pattern? Actually the most common thing used is Elmer ALL PURPOSE glue slightly diluted w/water. the thicker the glue the stiffer the product. School glue is more water soluble and not quite as sturdy. I just posted an entry showing it all pinned to a box and drying. But for all things you want permanently stiffened Elmer's is the way to go. But if the glue is diluted to much it is more susceptible to humidity which can make them sag (my Angle got a few wrinkles in her dress). but it can be redone if soaked in hot water then stiffened again. I have also known one lady who used wallpaper glue. THAT would definitely be permanent! 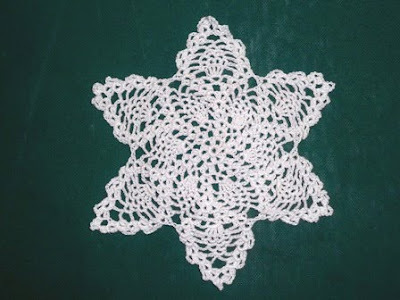 I got this pattern at http://www.crochetmemories.com/ they have a good amount of thread-work and the patterns are very easy to follow and well written. I'll be posting on your blog before the weeks out. Just been busy w/the kids, school starting, working 3rd and my DD is getting braces. OH, and if you REALLY want it permanent you can seal it in a clear coat glaze after it's stiffened. i have a couple patterns that call for that but haven't done them yet. 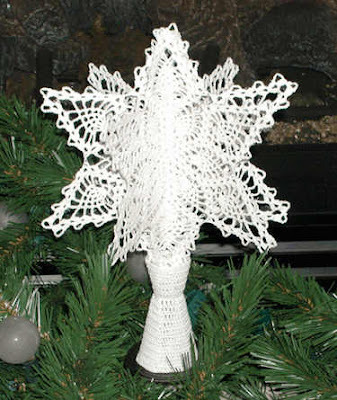 One is a tread crochet holiday wreath. Thanks Rachel, that is me sorted for my christmas decorations now! I've got plently of strong glue at home so I'll give it a try - soon!